I invite you to experience my 'home away from home' designed as a luxury apartment, not your typical rental. 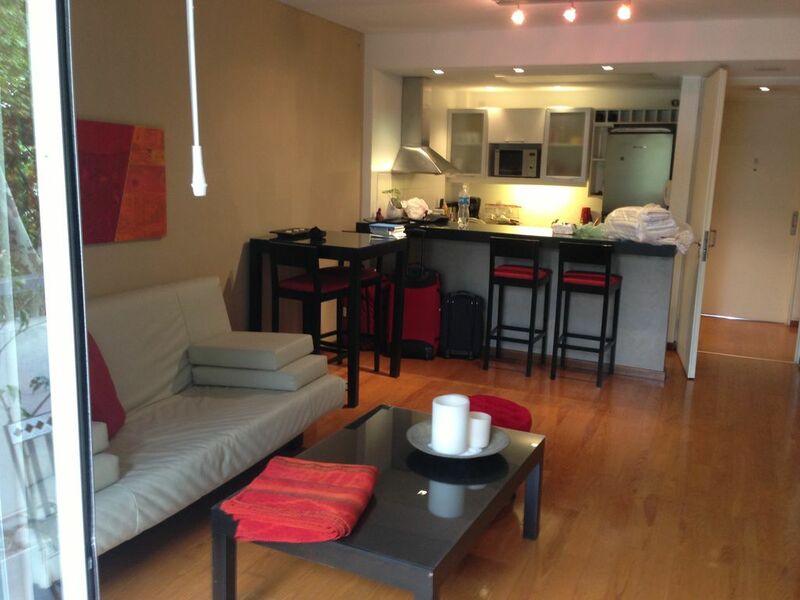 Large (690 sq ft) one bedroom apartment in Palermo Soho (Thames and Costa Rica) comfortably sleeps 4 adults. All the furniture and artwork I've personally selected. The apartment features lighting on dimmers, made to measure furniture, custom wall textures, rich wood floors and custom artwork by local artist Javier Herrera. It is the perfect place to stay and enjoy the many restaurants, cafes, and shopping in the exciting neighborhood of Palermo Soho. Palermo Soho is one of the most exclusive neighborhoods in Buenos Aires and you will be right in the heart of it. Numerous Restaurants including French, Sushi, Argentine within one block. Grocery Store and laundromat is one block away. There is a bus stop on the corner and a 5 minute walk to the subway stop in Plaza Italia. The kitchen features granite counters, stainless appliances, wine storage, microwave, under counter lighting and a bar with bar stools. The fully equipped kitchen includes most cookware, glasses. pots, pans, if you wish to prepare your own meals. There are many restaurants within a 1 block radius. The living room offers a Phillips 32” flat panel LCD TV, slim-line stereo CD player with MP3 input, Phillips DVD player, and a cordless phone with voicemail. The sofa converts to a full size bed with sheets and pillows. There is a small dining area as with a bar style table and four Italian bar stools. The condo has been designed with those in mind who might wish to prepare their own meals. Palermo Soho has the best dining in the city, but you'll appreciate the large kitchen and ability to make your own meals if booking a longer stay. The private bedroom has a queen size bed, two night stands, a reading light, alarm clock, safe and large closet. I chose a Simmons Beautyrest Spa pillow-top mattress for the queen size bed. The bedroom opens up to a large 5th floor balcony overlooking the street below. The balcony is very enjoyable year round as you are right at the tree tops. This was always my favorite spot to enjoy breakfast or a glass of wine at night. And don't forget to check out the 8th floor terrace with views of the city. The condo has a full size modern bathroom with sink and vanity, toilet, bidet, and a shower/tub combination. It features dimmable lighting, under counter accent lighting, and storage behind the mirror. All sheets and towels are provided. Located in a newer building with well-lit contemporary entry, secure entry system, a modern elevator, and a terrace on the 8th floor with sweeping views of the city from 360 degrees. There is cable, high-speed WiFi internet, a free loaner cell phone and weekly maid service included. We offer flexible check in and check out times as many international flights arrive in the morning and depart at night. We can also arrange an airport pick up with our own driver. My apartment manager speaks perfect English (as well as spanish) and is available to assist with recommendations. I lived in Buenos Aires from 2006-2010 and loved it so much that I purchased my own condominium. It is my home away from home--where I stay anytime I visit. I'm a full time real estate broker living in Downtown St Louis, Missouri. I take pride in my residence and enjoy sharing it with others when I'm not in the country. I wanted to purchase in a new building foremost. Many of the older buildings in Buenos Aires do not have modern systems or elevators. My other criteria was that it HAD to be located in Palermo Soho, the most vibrant neighborhood in the city! This neighborhood is very safe and popular with tourists. The condo has a great floor plan that feels almost like a two bedroom residence. The queen bedroom has it's own door off the hallway. The living room/kitchen area also has a door from the hallway adding privacy if someone is sleeping in this area. Each guest can access the hallway (and bathroom) without disturbing the other rooms. The living room sofa converts to a full size bed with sheets---so use it as a living room by day and a second bedroom by night! Ample sized refrigerator especially important for longer stays. Fully equipped kitchen if you'd like to prepare your own meals. Stayed 6 nights at this lovely apartment. The location is perfect, in the heart of Palermo Soho. Restaurants, nightlife, wine shop, laundry, supermarket all within a 2-3 block walk. The upgraded WiFi was strong and fast and the AC worked perfectly. Plenty of pressure and hot water in the shower. The owner Jeffrey and apartment manager Guille were immediately responsive and offered great suggestions for the area and BA in general. They even arranged airport pickup for me. The only downside is that like most of Buenos Aires, it can be noisy. I am a very light sleeper and it took me a while to get used to the street noise. But everything else about my stay was perfect. We enjoyed our stay very much. The apartment has plenty of room and is well equipped for visitors. Palermo Soho is an excellent neighborhood for visitors-- lively but not noisy, and accessible to the Subte. The accommodations are very pleasant: comfortable bed, adequate closet space, well-equipped kitchen, and nice living room and balcony for relaxing. The property manager was extremely pleasant and helpful. We highly recommend this apartment to visitors. Thanks so much for your review! I'm glad you found the place comfortable and well equipped! Please visit us again. Great location! The apartment was very comfortable and well kept. We had an awesome time! The apartment is located near terrific cafes and restaurants. The neighborhood was so much fun! The property manager Guille was very friendly and helpful. We look forward to going back. The apartment is very comfortable. You don't have to wait more than 50 seconds to hail a taxi. The neighbourhood is charming and the manager, Guille Providenti, is extremely resourceful. We stayed here for just over two months. The apartment is in a great neighborhood of Palermo Soho. Lots of shops, restaurants, parks, clubs, music, etc. We walked nearly everywhere from here and only took cabs to the airports and ferry terminal. Cabs are plentiful and easy to get right outside your door. The apartment is comfortable. The pull-out couch worked well for our adult son's visit. Not a fan of the bed that sits so low to the ground, but I guess that's very common in Argentina. It was comfortable but a bit soft for our tastes. The small kitchen was fine. We mainly stored snacks and drinks in the refrigerator. We ate out nearly all the time. Whatever we needed in the kitchen was there, ie corkscrew, paper towels, silverware, dishes, etc. We just had to replenish some supplies since we stayed there so long. The shower was fine..plenty strong and lots of hot water after a short wait. Bathroom was adequate; towels were high quality as were the bed linens. We appreciated that! Balcony furniture was a bit uncomfortable, but nice to have a place to sit. The owner has ordered the sliding door to be replaced; we couldn't lock it. We worked the entire time we stayed in Argentina and really appreciated all the effort the owner and manager went through to get the highest speed internet available in Buenos Aires. Worked consistently great. The biggest issue we had with the apartment was outside the control of the owner: the street noise. We live in a downtown area at home but never appreciated the concept of noise pollution until we traveled to South America. The noise is fairly constant except from 6-9 am. It's really important to either bring a sound machine with you or to have an app on your phone to block out the noise from the bars, the squeaky buses, loud motorcycles, etc. It's part of being in a big South American city, but this area appears especially noisy at night with all the bars and restaurants. While the apartment isn't what we would consider luxurious, it worked out well for us. We traveled around Argentina and appreciated having our stuff kept safely in the apartment. I definitely recommend this apartment to anyone looking for a nice neighborhood and a safe, comfortable place to stay. The managers were great with this suggestions and help. They checked in on us to make sure all was ok. We appreciated that. Also nice to have weekly cleaning. Includes Welcome bottle of Argentine wine and loaner cell phone. No pets, Smoking outdoors only.